This article is about the 1996 live-action film. For the 1961 animated film, see One Hundred and One Dalmatians. For the original children's novel, see The Hundred and One Dalmatians. For other uses, see 101 Dalmatians. 101 Dalmatians is a 1996 American live-action family comedy film based on Walt Disney's 1961 animation adaptation of Dodie Smith's 1956 novel The Hundred and One Dalmatians. Directed by Stephen Herek and co-produced by John Hughes and Ricardo Mestres, it stars Glenn Close, Hugh Laurie, Mark Williams, Tim McInnerny, Jeff Daniels and Joely Richardson. In contrast with the 1961 film, none of the animals talk in this version. Released on November 27, 1996 by Walt Disney Pictures, the film was praised for its faithfulness to the animated classic. It received mixed reviews, but was a commercial success, grossing $320.6 million in theaters against a $75 million budget. Close, who was universally praised for her portrayal as Cruella de Vil, was nominated for a Golden Globe for Best Performance by an Actress in a Motion Picture - Comedy or Musical, but lost to Madonna in Evita. A theatrical sequel titled 102 Dalmatians was released on November 22, 2000 with Close and McInnerny reprising their roles. Despite receiving mostly negative reviews, 102 Dalmatians was again a commercial success. American video game designer Roger Dearly (Jeff Daniels) lives with his pet dalmatian Pongo in London. One day, Pongo sets his eyes on a beautiful female dalmatian named Perdy. After a frantic chase through the streets of London that ends in St. James's Park, Roger discovers that Pongo likes Perdy. Her owner, Anita Campbell-Green (Joely Richardson) falls in love with Roger when they meet. They both fall into the lake as a result of their dogs chasing each other, but they return to Roger's home and Anita accepts his proposal. They get married along with Perdita and Pongo. Anita works as a fashion designer at the House of de Vil. Her boss, the pampered and very glamorous Cruella de Vil (Glenn Close), has a deep passion for fur, going so far as to have a taxidermist, Mr Skinner, skin a white tiger at the London Zoo to make it into a rug for her. Anita, inspired by her dalmatian, designs a coat made with spotted fur. Cruella is intrigued by the idea of making garments out of actual dalmatians, and finds it amusing that it would seem as if she was wearing Anita's dog. Anita soon discovers that Perdy is pregnant and is then informed by Nanny (Joan Plowright) that she (Anita) is, too, much to her shock. Some time later, Cruella visits their home and expresses contempt upon meeting Roger. Her initial disgust at them having a baby turns to excitement when she finds out Perdy is expecting too. Several weeks later, she returns when a litter of 15 puppies are born and offers Roger and Anita £7,500 for them, but they refuse. She dismisses Anita and vows revenge against her and Roger. She has her henchmen, Jasper and Horace (Hugh Laurie and Mark Williams) break into their home and steal the puppies while Roger and Anita are walking in the park with Pongo and Perdy. Along with 84 others dalmatians that were previously stolen, they deliver them to her ancient country estate, De Vil Mansion. She also hires Skinner to kill and skin them to create her coat. With the family devastated at the loss of their puppies, Pongo uses the Twilight bark to carry the message via the dogs and other animals of England, while Roger and Anita notify the Metropolitan Police. A dog who had witnessed the stolen puppies follows Jasper and Horace to the mansion, and finds all of them inside, before helping them escape under the duo's noses. They make their way to a nearby farm, where they are later joined by Pongo and Perdy. Cruella arrives at the mansion and soon discovers what has happened. Furious, she decides to carry out the job herself, while Jasper and Horace attempt to search for them also. After several mishaps, Jasper and Horace discover nearby police on the hunt for Cruella and her henchmen and hand themselves in, joining Skinner who was beaten earlier while trying to kill Lucky (one of the 15 puppies), who had been left behind. Meanwhile, Cruella tracks the puppies to the farm where they are hiding and tries to retrieve them. However, they outwit her and cause her to fall into a vat of molasses and get thrown through a window into a pig pen. Shortly afterwards, the fleeing dalmatians (including Lucky) are found and sent home via the Suffolk Constabulary, while those looking for Cruella arrive at the farm to arrest her. In the police van, she belittles Jasper, Horace, and Skinner for their incompetence before they are sprayed by a skunk which she had mistaken for her bag. Pongo, Perdy and their puppies are reunited with Roger and Anita. After being informed that the remaining 84 puppies have no home to go to, as they have not been claimed by their original owners, they decide to adopt them, bringing the total to 101. Roger designs a successful video game featuring dalmatian puppies as the protagonists and Cruella as the villain and they move to the English countryside with their millions. Anita eventually gives birth to her and Roger's first child, and at the very end of the movie, it's implied that she's pregnant with her and Roger's second child. The role of Cruella had been previously offered to Sigourney Weaver (Close took it after finishing her run in the musical Sunset Boulevard). Cathy Moriarty was briefly considered for the role, but was later deemed too frightening for a children's film after doing a screen test (Moriarty appeared alongside Eric Idle, who portrayed Waddlesworth the macaw in 102 Dalmatians, in Casper. The animatronic creatures used in the film are provided by Jim Henson's Creature Shop. Minster Court was used as the exterior of Cruella De Vil's fashion house. Sarum Chase was used as the exterior of her home. The UK premiere of the film was held on December 4, 1996 at the Royal Albert Hall, London and the exterior of the Hall was lit with dalmatian spots. It performed very well at the box office, earning $136,189,294 in the United States and $320,689,294 worldwide. The film received generally mixed reviews: on review aggregate Rotten Tomatoes, it has a "rotten" rating of 38%, with an average rating of 5.4 out of 10 from 33 reviews, with a lot of criticisms devoted towards its plot and use of slapstick humor (akin to Hughes' Home Alone films and his later Disney remake, Flubber, a year later). However, Close's performance as Cruella de Vil was universally praised, as was the essential faithfulness of the original classic. Animal rights organizations protested the film's release, noting that after the premiere, Dalmatian sales shot up, due to children asking for one after seeing the film with their parents. Dalmatians, however, are difficult dogs to take care of and many were eventually dropped off at pounds and put down. The film was released on VHS for the first time on May 6, 1997, and on DVD on December 12, 2000. Due to the high sales of the One Hundred and One Dalmatians Platinum Edition DVD, Disney re-released it on September 16, 2008, in the U.S., along with its sequel, 102 Dalmatians and that to the original 1961 animated version, 101 Dalmatians II: Patch's London Adventure. 101 Dalmatians was re-released on DVD and is part of the 4-Disc Special Collector's Edition line along with Who Framed Roger Rabbit, All Dogs Go to Heaven and The Rescuers Down Under. 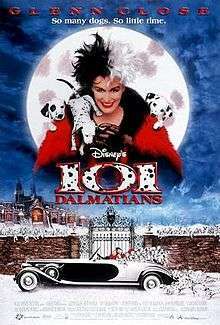 A video game based on the film entitled, 101 Dalmatians: Escape from DeVil Manor was released in May 1997. A sequel, 102 Dalmatians, taking place four years after the first film's events, was released on November 22, 2000. The film's early working title was 101 Dalmatians Returns. It received mostly negative reviews from critics, but was a commercial success. On September 30, 2013, The Hollywood Reporter confirmed a live-action Cruella de Vil film titled Cruella is in development by Disney. Screenwriter Aline Brosh McKenna most known for writing The Devil Wears Prada was set to write it for Disney, with Andrew Gunn as producer. Glenn Close will be executive producer. On January 6, 2016, The Hollywood Reporter announced that Kelly Marcel, who wrote the script for Saving Mr. Banks and Fifty Shades of Grey will instead write the film, while Emma Stone was in talks for the role. On April 25, 2016, it was confirmed that Stone accepted the role. On August 2, 2016, The Tracking Board reports that the script is being revised by Edge of Tomorrow and Spectre co-writer, Jez Butterworth. ↑ "101 Dalmatians (1996)". IMDb. ↑ http://www.creatureshop.com/productions_film.php Archived August 27, 2013, at the Wayback Machine. 1 2 "101 Dalmatians filming locations". Movie-Locations.com. Retrieved 4 October 2014. ↑ Puig, Claudia (December 2, 1996). "'101 Dalmatians' Nabs Top Spot". The Los Angeles Times. Retrieved November 3, 2010. ↑ "101 Dalmatians (1996)". Box Office Mojo. Retrieved November 5, 2008. ↑ "101 Dalmatians Movie Reviews, Pictures". Rotten Tomatoes. Retrieved January 18, 2011. ↑ "Activists Protest Disney Dalmations". Cinema.com. August 30, 2000. Retrieved March 22, 2016. ↑ "Disney's 101 Dalmatians [VHS]". Amazon. Retrieved March 22, 2016. ↑ "101 Dalmatians". Amazon. Retrieved March 22, 2016. ↑ Kit, Borys (2011-11-17). "Disney Preps Live-Action Cruella de Vil Film (Exclusive)". Hollywoodreporter.com. Retrieved 2013-10-02. ↑ "Disney is making a live-action Cruella de Vil movie". Entertainment Weekly. 1 October 2013. Retrieved 1 October 2013. ↑ Borys, Kit (January 6, 2016). "Emma Stone in Talks to Play Cruella de Vil for Disney (Exclusive)". Hollywood Reporter. Retrieved March 22, 2016. ↑ Takeda, Allison (April 26, 2016). "Emma Stone as Cruella de Vil and More Live-Action Fairy-Tale News From Disney". Us Magazine. Retrieved June 10, 2016. Wikimedia Commons has media related to 101 Dalmatians (1996 film).